The average price of single malt whisky at auction declined by 2.2% in 2015, with Karuizawa the sole star performer. According to a report released today, investments in rare bottles of whisky have risen by over 14% in value over the course of 2015, outperforming wine, gold and the FTSE 100. Headline figures state that 43,458 bottles of single malt whisky were auctioned for a total value of £9.56m within the UK, representing increases of 28% and 25% in volume and value respectively. What do these numbers tell us? Based on the above figures, the average price fetched at auction by a bottle of single malt whisky in the United Kingdom in 2015 was £219.98. In 2014, 33,998 bottles of single malt whisky were for a total value of £7.64m, giving an average price of £224.72. The average price at auction of single malt whisky in 2015 has therefore fallen by 2.2%, or £4.74, over the last 12 months. This is clearly far less than the 14% rises attributed to whisky as an investment class. Moreover, the median bottle auctioned (half were dearer, half cheaper) between December 2014 and September 2015 fetched £77 – less than half of the average price for single malt whisky at auction in either 2014 or 2015. A minority of ultra-premium bottles sold at auction are therefore skewing the average single malt price upwards. What about the ultra-premium whiskies themselves? Take the example of The Macallan Robert Burns Semiquincentenary Decanter, one of the bottles included in the Rare Whisky 100 Index, of which 250 bottles exist. Over the last four years, The Macallan Robert Burns has been auctioned 28 times at Scotch Whisky Auctions, which has traditionally been the largest UK whisky auction house by volume in recent years. If we exclude the 3 instances where the reserve was not met, it has always fetched in excess of £1,000. The latest price fetched by this whisky at SWA was £1,750 in December 2015, a rise of 6% over its hammer price in December 2014, and 46% since its first appearance at £1,200 in October 2011. As positive as these gains are, the potential for profit is greatly reduced once auction fees and the VAT applicable to those are factored in. In the case of Scotch Whisky Auctions, 10% commission is charged on both sales and purchases, with an additional £3 listing fee charges for selling; all fees attract VAT, which has stood at 20% since January 2011. The chart above shows the real price of buying and selling at the hammer price, once additional fees have been included. (Postage and packaging have not been factored in, which represents an extra expense on both purchases and sales.) For a profit to be made, the yellow sale point needs to be higher than the red purchase point. To achieve this, investments have generally required a period of years to make a return in excess of the purchase price. 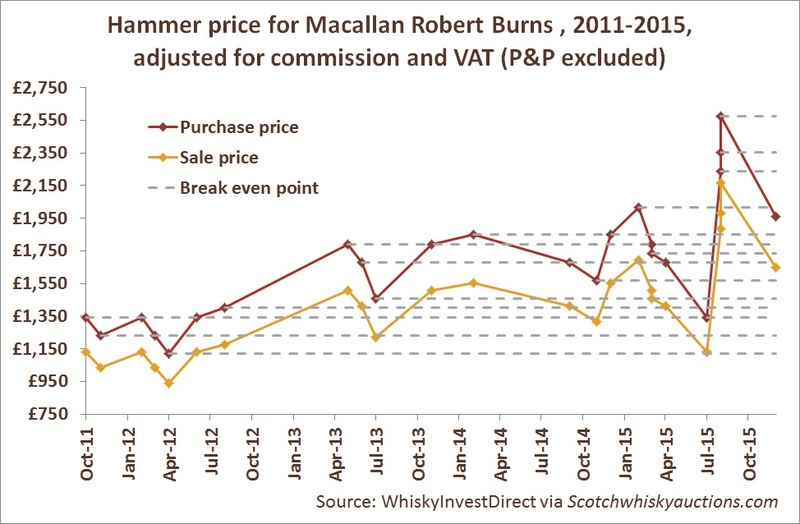 Based on the most recent price fetched at auction, there have only been 3 times since January 2013 (July 2013 and two lots in July 2015) where prices of The Macallan Robert Burns would have been sufficiently low to allow investors to turn a profit through a subsequent auction sale. Historic highs of £2,000-£2,300 were reached by three lots in August 2015, but these were between 67% and 92% in excess of the prices fetched by the same item only one month earlier, showing precisely how volatile prices for ultra-premium whiskies can be at auction. The one unquestionably stellar performer at auction in 2015 was Karuizawa, whose average value rose by 75% in 9 months. Yet in both the United Kingdom and Hong Kong, Karuizawa has very much been the exception that proves the rule over the last year, with other whiskies failing to come close to matching its performance at auction. This trend looks set to continue. In Bonhams’ most recent auction in Hong Kong, 90% of Karuizawa bottles met their reserve, compared to only 62% lots of single malt overall, while only 21% of bottles from Brora, a sought-after distillery which ceased production in 1983, were sold. In short, the performance of rare whisky at auction in 2015 offers no compelling reason to re-consider bottled whisky as a significant asset class. Whisky auctions are a fantastic place to find rare and unusual bottles of whisky, and the service which they provide has certainly contributed to the increased public interest in Scotch whisky today. Nor is it impossible to make a profit from auctioning rare whisky. As the example of The Macallan Robert Burns shows, large profits in percentage terms were possible on individual bottles, and may continue to still exist, but in recent years this has become much more difficult. Yet to be considered an asset class, the rare whisky auction market would have to demonstrate an average overall upward trend in value over time. Figures given for recent years suggest no discernible overall upward trend in value for most bottles. Investors must therefore consistently beat the market to make a profit, which requires a high degree of research and knowledge. At a value of £9.56m, the whisky auction market is still tiny compared to the $346m (£225m) wine auction market, and will struggle to sustain any large investments. Aside from the possible exception of ‘Picking Winners’, there is little to suggest that substantial profits can be made from a sizeable investment in bottled rare whiskies.